In this topic, you will learn how to create a responsive video player that resizes based on screen dimensions. Responsive sizing means resizing player in response to changes in the size of the bounding window, while maintaining the aspect ratio, so that the video is not letterboxed (see image below). When you embed a video player in a page, you will notice that it does not resize with the browser window. This occurs because, by default, the video player is given a fixed width and height, preventing it from responding to changes in the browser. One aspect of responsive web design is ensuring that elements within your page adapt gracefully to different screen sizes. The samples in this document do not address all the aspects of responsive web design, which might include font changes and whole layout transformations. Resize the browser to see how the video player resizes while maintaining the video aspect ratio. You should not see any letter-boxing around the video. Note that this document page has a maximum width for content. The following sections explain the player and the HTML code used in the example. While you can manually add HTML to your player embed code to create a responsive player, the easiest way is to use the Players module in Studio. In the Players module, create a new player or use an existing one. Locate the Settings section and click Edit. Set the Sizing property to Responsive. Optional: You can add a width property in the Player Dimensions setting. With a responsive player, this sets a maximum width for the player. Click Save and then Publish the player. In the Media module, select a video and publish it with this player.Assign video content to the player and publish it. You can also set the Sizing property to Responsive when you publish a video from the Media module. Copy either the Standard (iframe) or Advanced (In-Page) embed code and paste it into a new HTML file. Lines 1-10: Is the embed code that you copied when publishing a video with the player. Line 1: Defines an outer container that sets the maximum width for the player. The default is set to 100%. If you set a width in Studio, your player will be responsive up to the maximum width size. Line 2: Defines an inner container that uses an intrinsic ratio to set the height and maintain the correct aspect ratio. To learn more, see the Understand intrinsic ratio section. Lines 3-8: Contain the player code for the iframe implementation. Notice that line 3 has a style attribute which positions the player to fill its parent container. This allows the player to change size as the browser changes size. container around the video player and set the padding-top property with the desired aspect ratio for the video. The padding property is the magic that styles a box with an intrinsic ratio. This is because the padding property is set as a percentage of the width of the containing block. It works well since padding styles are supported in all major browsers. This solution is borrowed from a blog post by Thierry Koblentz. For more details about browser compatibility, refer to his blog post. The aspect ratio is determined by a simple calculation to determine a percentage. For instance, calculate the percentage for a video with a 16:9 aspect ratio by dividing 9 by 16 (i.e. 9/16 = .5625) to get 56.25%. For a 16:9 video, you want the height to be 9/16ths of the width. The Video.js library v5.0.0+ has been updated to support simple responsive classes. These classes are supported by the Brightcove Player when using the Advanced (In-Page) embed code. The fluid classes listed above apply the responsive sizing to the player. They accomplish this by applying a padding-top attribute to the video element. 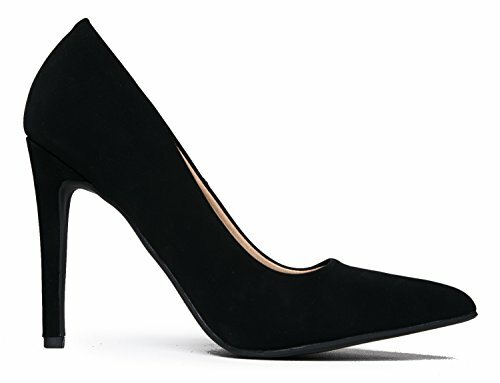 Heel measures approximately 3.75 inches"
GIVE YOU A BOOST: These pumps are the perfect pair to add a few inches to your frame and elongate your legs! 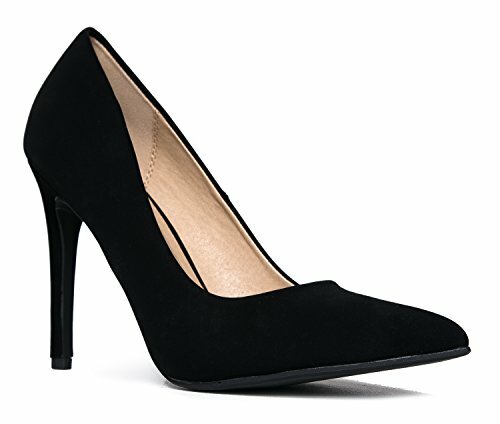 Style it with your classic office outfit during the day and rock it with your favorite little black dress to dance the night away �C either way, these heels are a surefire to take you anywhere! 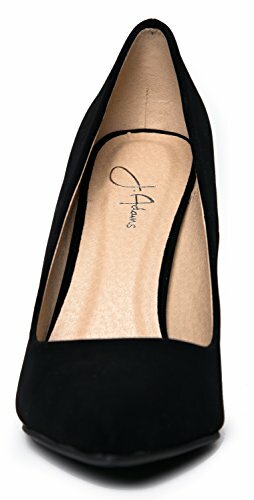 TIMELESS DESIGN: With the classic style of these pumps, you��re sure to wear these heels for years regardless of the color you get. Keep a pair of these heels in your wardrobe knowing that you��ll be able to complete every ensemble with ease! You won��t regret it. CONFIDENTLY STRUT: With these shoes, you can stay confident knowing that the cushioned foot-bed will form to your unique foot arch. You won��t have to deal with buckling straps either so you can feel confident taking on each and every day! DOING OUR PART: At J. Adams, we care about not only the quality of our shoes but also the quality of the world we live in. These high heels are made with only the best 100% vegan material! MEASUREMENTS: Heel 3.75��. Runs True to Size.